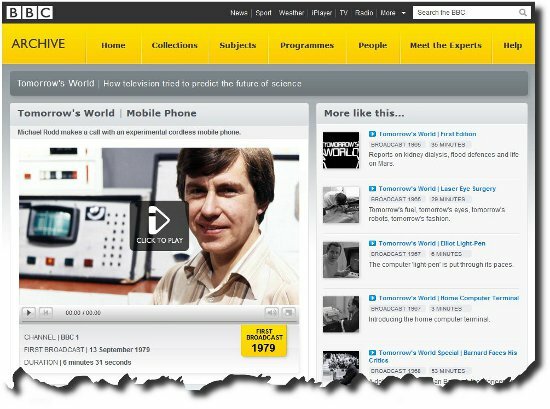 From the archives of the BBC this is one of a series of archived BBC programs from Tomorrows World, the BBC’s program focusing on technology and future technologies. A fascinating view from the past to how back then we’d thought we’d be living now. Worthy of seeing how well we can second guess our future. This short film from presenter Michael Rod shows how an FM portable transceiver has been wired into the telephone network. At the time this was an illegal thing to do, other than with express permission from the Home Office. This is the first Direct Dial prototype mobile phone. Prior to this the caller would have to be connected via a Telephone Operator as no direct dial facilities existed. With my fledgling Radio and Electronics career, my role was just prior to this change over and the mobile phones I made were so small they were built into and used an entire briefcase. Brick sized mobiles were the generation to come in four years time. Its worth watching for the end comments where the passive non interest from the Post Office is as good as it gets compared to the comments from the Home Office. Look where we are now. The whole series is priceless. From the office of the future to the then soon to be happening future event of when man eventually lands on the moon – the scientists argue the likelihood of the moon being like a jelly and the landing craft sinking into its surface – real fears that NASA had to consider at the time!